I love the Graceling realm!! Another fantastic addition to this series. I loved Bitterblue -- and the romance in this book was beautiful, even if it doesn't have a happy ending (yet.) Hoping there's more to come in this wonderful series! I also loved the connections between the Graceling Realm and the Dells. 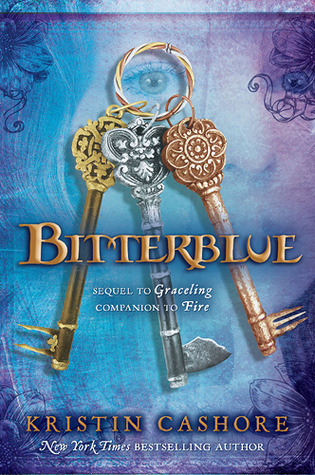 One of my favorite things about this book was that unlike Katsa and Fire, Bitterblue does not have a special power. Katsa and Fire are physically strong women, whereas Bitterblue is small. Bitterblue's strength comes from her mind -- her way of not allowing Leck to control her mind was by doing complicated math problems in her head, and this mental way of overcoming a problem symbolizes Bitterblue's general method of dealing with anything that crosses her path. She is strong, but still vulnerable. Her love for others and determination to do what is right even if it's hard for her is what makes her a great and respected ruler. And the LOVE STORY is fantastic! It reminds me of the beginning of Aladdin, when Jasmine sneaks out of her palace as a commoner. When Bitterblue is pretending to be "Sparks," the reader gets to see a side of her that we might not have otherwise, a side of her that isn't weighed down by royal obligations and can have fun and have a romantic tryst. This makes her such a three dimensional character. And the royal reveal scene was done so wonderfully! It was heartbreaking to read! There are also so many great mysteries in this book that are solved through the story. Yes, it's long, but I found myself needing to know what was going to happen next. I hope Kristin Cashore continues this series, because I want more of the Graceling Realm! Oh God I want this book!!!! 8_) I love Kristin Cashore!